We are in the midst of grape harvesting in our region at the moment, les vendanges. You can see the people with their trucks and machines along the little country roads, and there are signs warning you to be wary. I am more than happy to oblige. It seems that this vital activity is always on the verge of a crisis – whether from hail or poor weather conditions, pests or other pépins. Which brings me to the inspiration for this post. The seed that is found inside the grape, along with other fruits like apples, is called le pépin. For reasons that I have not been able to elucidate, this tiny seed or pip is associated with trouble. To encounter un pépin means to run into a problem of some sort along the way. Readers of this blog will have gathered by now that such things occur not infrequently in France. So although I do not know the etymology of the expression, I can easily imagine how the pip could be associated with trouble and strife. Eating fruit, for example. Personally, I would much rather drink grapes than eat them. But for those who are amorous of the grape itself, running into pips can be problematic. Do you spit them out? And then there’s wine making. Perhaps the grape seeds themselves are not good for the wine? Something to do with the tannins? On the other hand, I have recently learned that grape seed oil is a healthful choice for cooking as it has a relatively high smoke point, is full of antioxidants and promotes good cholesterol. And according to this source, you should chew and swallow the seeds as they are healthy for you. My dear late mother was a source of many wonderful things, not the least of which were her expressions. “She gives me the pip” was one of my favourites. Pépin le Bref was also the name of a king, the father of Charlemagne. I am useless with history, however, and will leave further explorations of his rather fascinating name to those more qualified. Will 2016 be a good year? It is hard to say. The summer was slow to start but hot and dry for a good long while. In any case, we’ll find out before long. The first young wines will be out in November. Until then, may you stay clear of les pépins! It is surely the world’s most reassuring sound. Whether eased from its niche with a gentle sigh or resoundingly and explosively popped, there is no other sound so associated with happiness than the uncorking of a wine bottle. I speak from a certain, ahem, experience. No neophyte with the corkscrew, I am rather familiar with le bouchon as it’s called in French. It wasn’t always so. It’s taken years of nightly uncorking with my trusty tire-bouchon to master this skill. Now, I pop like a pro: 30 seconds max, zero to glass. Imagine my surprise and delight in discovering that I was holidaying in the world capital of cork. Portugal. Who knew? Let me explain that neither husband nor I are history buffs. Sure, he knows his world politics and has a much more precise mental geography of what happened when than I. But when we travel, we do not visit historical sites with anything more than a passing interest. I enjoy some of the stories but retain none of the details. Dates, names….I can always google it. More than once we’ve been shamed to admit that we visited a place without seeing (nay, noticing!) its world famous castle with the UNESCO heritage moat. Instead, we like to wander around like free spirits and get a sense of a place, a feeling. This time in Sintra, near Lisbon, we decided to explore the area with the aid of e-bikes, and a guide to make sure we didn’t get lost. I’d never felt the need for such aids before, but heck, there were a lot of hills. And for once, I thought we could enjoy a holiday without arguing over which way to go. It was a brilliant plan. Our guide showed us around the park and surroundings, stopping at key points to give us snippets of information about its various castles but without forcing us to take into too much detail. When he saw how interested we were in the subject, he told us all about the cork tree. 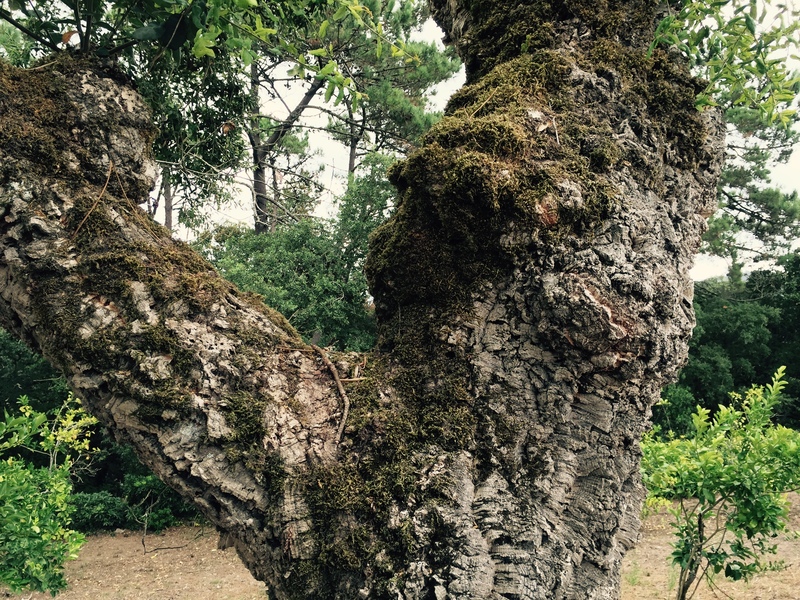 The cork oak is a wonderful thing. 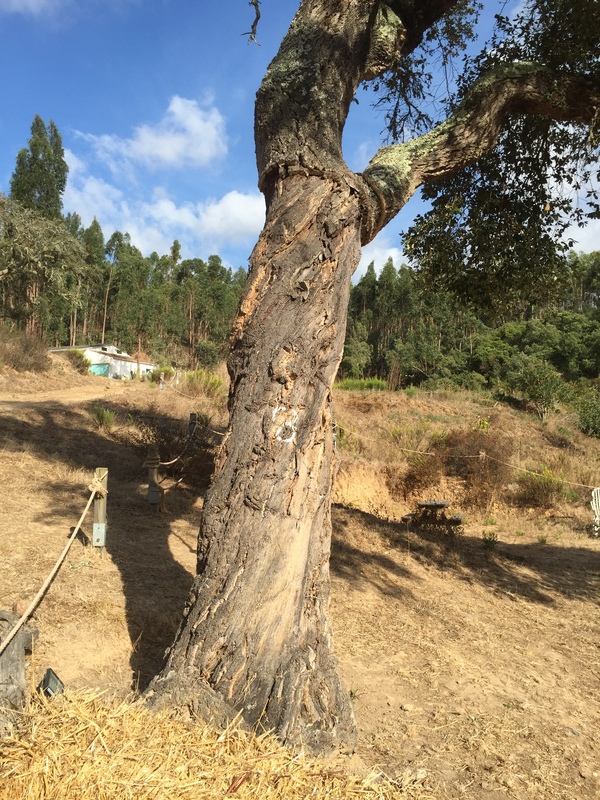 In Portugal, the bark is harvested every nine years. It is literally peeled away from the tree trunk, upon which the cork farmer paints the last number of the year in which it was harvested. Then, it regenerates before being harvested again. It is native to Portugal and a few other places but not that many. Oh well, if you want more detail you can always Wiki it. Cork is used for many things. I love how light and airy it is, yet so strong. It makes a great coaster and is also used for flooring. I even bought a pair of cork sandals. Extremely comfortable and only a little nerdy looking. Mostly, though, it is used as a stopper for wine. Wine producers have been using synthetic corks increasingly of late, so I had thought cork was an endangered species. But apparently it is a matter of cost. Now I make it a policy to prefer wines with the real thing and although it is hard to know before you open it, those that are ‘mise en bouteille à la propriété’ or bottled by the wine grower are more likely to use real cork. For years, I have been troubled by one question: what to do with all the leftover corks? It seemed a shame to throw them away but there is no recycling program for cork. Last year, however, I discovered they make a wonderful natural fire starter, Soak them in rubbing alcohol* for a day or two then put a couple in with your kindling and voilà! Une belle flambée! *Do be careful, though, that stuff is highly inflammable. Have you ever been to Portugal? Any thoughts on the wonders of cork?